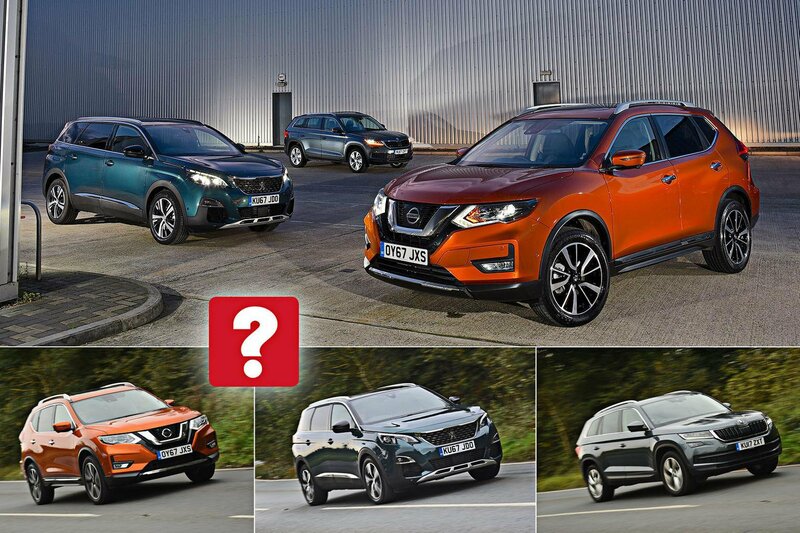 New Nissan X-Trail & Peugeot 5008 vs Skoda Kodiaq | What Car? The previous Peugeot 5008 was a practical car for those needing seven seats but was arguably the automotive equivalent of a moth: a hum-drum-looking MPV. But ta-da: look at the new one. Transformed into a butterfly with swashbuckling SUV style, the 5008 now has the borderline pizazz of a concept car. But is it a better choice than rivals? First, we have an updated Nissan X-Trail to trial it against. 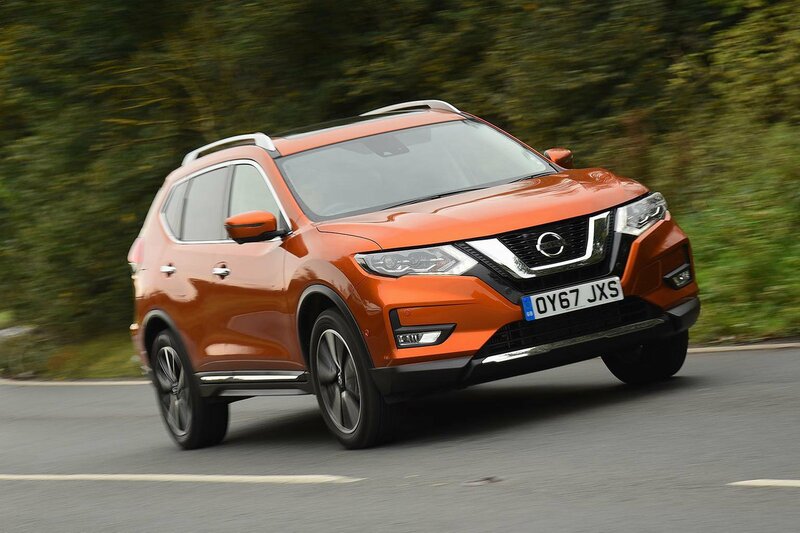 Nissan says that, along with a subtle exterior makeover, it has given the interior upgraded materials and has improved safety to stop you banging bumpers outside the school gates. Both have to beat the Skoda Kodiaq, our current Large SUV of the Year. It’s barely a year into its life and, during that time, we’ve rated it highly, thanks to impressive practicality, a good driving experience and reasonable running costs. All three cars are lined up here in diesel form and in posh trim levels, and all have seven seats (optional in the Kodiaq and X-Trail, standard in the 5008). So, let battle commence. All three cars could be termed ‘steady Eddies’ due to their adequate performance, but that doesn’t mean there’s no distinguishing them. 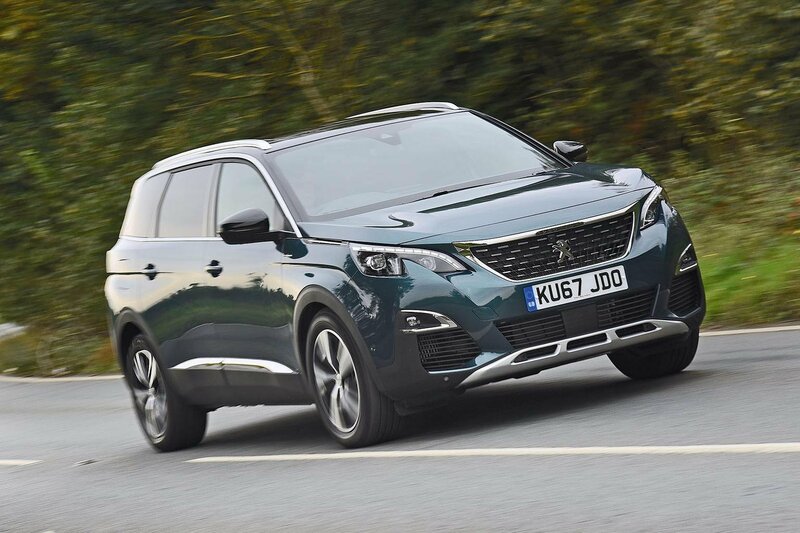 The 5008 and Kodiaq make identical power (148bhp) from their 2.0-litre diesel engines, although the former has more low-rev pulling power. The Kodiaq, with its rapid-shifting automatic gearbox (the only option in this trim; the 5008 and X-Trail, meanwhile, are manuals), may achieve 0-60mph in the quickest time, but how often are you likely to be involved in a drag race in your seven-seat SUV? 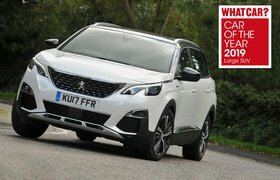 It’s on the multitude of occasions when you put your foot down at, say, 30mph in third gear that you need some welly, and the 5008’s extra low-end grunt means it responds more immediately. So, by the time the Kodiaq’s gearbox has jumped down the couple of gears needed to match it, the 5008 has hitched up its skirt and gone. Where does that leave the X-Trail? Well, trailing in outright acceleration by dint of having the least potent (128bhp) 1.6-litre engine. But its manual ’box has lower ratios. These help to make up for the power deficit and, on paper, its in-gear acceleration times are competitive. Yet, in real-world driving, the X-Trail always feels more sluggish than its rivals. There’s a drawback with shorter gears: the engine revs harder. At 70mph on the motorway, while the other two cars’ engines are spinning at 2000rpm, the X-Trail’s is racing at 2500rpm. The result: more engine noise. In the other cars, you can barely hear their mechanical hearts pumping away. This, and the fact that the X-Trail generates the most tyre noise, makes it the least refined cruiser. The Kodiaq and 5008 keep tyre noise nicely at bay, although wind noise in the former can get quite intrusive. That makes the 5008 the most soothing mile-muncher. What of refinement elsewhere? Around town, the X-Trail’s gruff engine sends the most vibration through its gearlever and pedals, and while the Kodiaq’s diesel isn’t as abrasive, it still booms slightly when you accelerate. You’re never in any doubt that the 5008 is a diesel, either, but it’s the least invasive of the trio. The 5008 has the nicer gearchange of the two manuals; the lever has a longish throw, but the well-defined gates tell you clearly which direction to head in for the next gear. The X-Trail’s light gearlever has a slightly glutinous feel between ratios. Then there’s the X-Trail’s ride. On standard 19in wheels, it takes speed bumps with aplomb, but through an average British town, strewn with scruffy asphalt, it bobs and thuds annoyingly. To an extent, it settles the faster you go, but poor damping still means your head gets shaken from side to side. 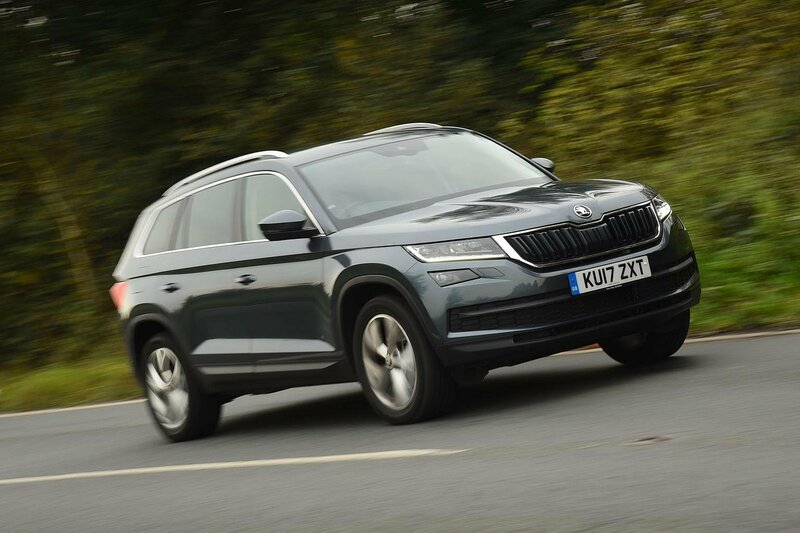 The Kodiaq, also fitted with standard 19in wheels, is available with optional adaptive suspension in four-wheel-drive form, and that set-up delivers a relatively comfortable ride. However, our front-wheel-drive test car can be had only with the standard passive dampers, and the ride suffers as a result. It’s better damped than the X-Trail, so there’s less bounce over dips and crests, but on motorways the Kodiaq’s firmness means it picks up on every ripple. That’s less noticeable around town, where it’s smoother than the X-Trail but still no match for the 5008. The 5008 is simply the most comfortable car to mooch about in; whether you are plodding along city roads or cantering up the motorway, it displays better composure than the X-Trail and less abruptness than the Kodiaq. Handling is probably not the biggest concern to the average large SUV buyer, but the Kodiaq does corner tidily. It leans the least and changes direction the most crisply. It also has the most intuitive steering – not just in terms of accuracy, but also in the way it gives you a sense of available grip. The 5008 isn’t far behind. The steering wheel is incongruously small, making the car feel oddly keen to dart into corners; it takes a bit of getting used to. But eventually you do and you’ll discover that the steering weights up nicely. And even though the 5008 leans a little more and doesn’t grip quite as tenaciously as the Kodiaq, it’s still a confidence-inspiring car to hustle along. Hustling is the last thing the X-Trail responds well to. It sways from side to side as you change direction, while the lack of resistance in the steering has you guessing how much grip there is. One thing’s for sure: it runs out of grip the soonest. Put simply, it drives more like SUVs from a decade ago rather than one that’s just been updated.